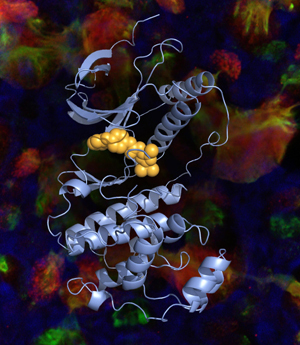 Michael Holtzman, MD, and his colleagues designed drugs (yellow) that bind with the MAPK13 enzyme (grey) to limit excess mucus production in airway cells. According to Holtzman, the drugs could help patients with life-threatening respiratory conditions including COPD and asthma. Now, Holtzman and his colleagues have described the molecular pathway responsible for excess mucus in airway cells and have used that information to design a series of new drugs that inhibit that pathway. Their study appears online Nov. 26 in the Journal of Clinical Investigation. Chronic respiratory disease, especially COPD, is the third leading cause of death in the United States and worldwide. Smoking and exposure to pollution are major causes of these diseases. Related conditions that affect the respiratory airways, like asthma and bronchitis, are also among the most common causes of human disease in adults and children. The morbidity and mortality from these conditions is closely linked to excess mucus production that blocks the airways and prevents normal breathing. However, there are no effective treatments to address the overproduction of airway mucus. As part of the new research, the scientists discovered that a critical signaling molecule, CLCA1, has a special role in the mucus pathway. They showed that CLCA1 allows a protein known as IL-13 to turn on the major mucus gene in airway cells. The researchers also showed that CLCA1 needs help from an enzyme called MAPK13. Although there were no existing drugs that acted against MAPK13, Holtzman says there were several that inhibit a similar enzyme known as MAPK14, which differs slightly in structure. So Holtzman and his team built drugs with slimmer structures that could avoid the obstacles and better fit into the protein pocket of MAPK13. Indeed, the results show that some of their newly designed MAPK13 inhibitors reduced mucus production in cultures of human airway cells by 100 fold. Importantly, Holtzman says that this work had to be done in human cells because commonly used lab animals have different wiring for the mucus production circuit. For example, MAPK13 inhibitors were not effective in mice because other types of CLCA and MAPK proteins could continue to make excess mucus. 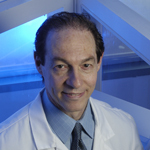 Beyond COPD and asthma, Holtzman also sees a possible role for MAPK13 inhibitors in related conditions with excess mucus production, like cystic fibrosis and even the common cold. Editor’s Note: Holtzman and his colleagues worked with the Office of Technology Management to file a provisional patent on the new compounds developed in this study. Journal of Clinical Investigation. Online Nov. 26, 2012. This work was supported by grants from the National Institutes of Health (NIAID AADCRC U19-AI070489 and MRCE U54-AI05160, and NHLBI P01-HL29594, R01-HL073159, CADET P50-HL107183, and K08-HL083095) and the Martin Schaeffer Fund. It was further supported by the Flow Cytometry Core in the Siteman Cancer Center and the Cores in Pulmonary and Critical Care Medicine. These Cores include the Epithelial Cell Core supported by the Children’s Discovery Institute. Structural results were derived from work performed at Argonne National Laboratory (ANL) Structural Biology Center and the Advanced Light Source, Berkeley CA (ALS). ANL is operated by U. Chicago Argonne, LLC, for the U.S. DOE, Office Biological and Environmental Research (DE-AC02-06CH11357). ALS is supported by the Office of Basic Energy Sciences of the U.S. DOE (DE-AC02-05CH11231). Confocal microscopy was derived in part from work in the Microscopy and Digital Imaging Core of the University Research Center for Auditory and Vestibular Studies supported by NIH NICDD P30DC04665.